Birdfinders sent two completely full tours to Israel in March 2011 and, true to form, we were not at all disappointed. Remarkably, both tours had amazing success with the 'big five' key West Palearctic species; Macqueen's Bustard, Hume's Owl, Nubian Nightjar, Arabian Warbler and Syrian Serin. Long-billed Pipit might also be added to this list, seen in song flight on the first tour with much better views on the second tour. Whilst local Israeli birders discussed the apparent lack of common migrants in the Arava Valley, we focused on the more positive events, especially the incredible display of larks with eleven species seen in all. Perhaps the star amongst these was the Thick-billed Lark with each tour finding flocks of up to 150 birds. It's so hard to imagine that just 17 National records of Thick-billed Lark existed when the Birds of Israel was published by Hadoram Shirihai back in 1996! Other species included Bar-tailed and Temminck's Larks, Oriental Skylark, Greater Hoopoe-lark, and a major arrival of Bimaculated Larks during the second week. Dunn's Larks were reported but eluded both our tours, though in fairness most reports came from deep within restricted firing zones whilst a few other reports were simply erroneous. 'Scarcities' were a bit thin on the ground this year, but the first tour had three fabulous Caspian Plovers at Yotvata, a Ruddy Shelduck near Eilat and several African Swamphens in the Central Negev, whilst the second tour scored a Striated Heron behind our hotel and a skulking female Ménétries's Warbler in a bush loaded with six other species of Sylvia warbler! Both tours saw Black-shouldered Kites, including one bird carrying nesting material! The status of this species, formerly a great rarity in Israel, looks set to change in the near future. And then there was the large-scale migration of soaring birds for which Israel is justly famed. Both tours enjoyed swirls of raptors, White and Black Storks, Great White Pelicans and streams of Common Cranes (530 in one afternoon by the Dead Sea). 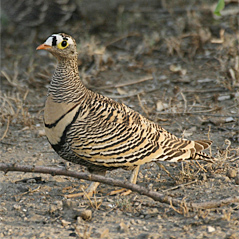 Perhaps the final word should go to the sandgrouse, and especially Crowned Sandgrouse. We recorded all five possible species on both tours, an event matched only by our recent autumn trip in November 2010. The numbers of Crowned Sandgrouse were simply unprecedented – we counted a staggering 140 ground feeding birds in the Central Negev on the second tour just when we thought the 66 seen on the previous tour couldn't be bettered! All of these birds were enjoyed via the amenities of an extremely well-appointed hotel directly overlooking Shulamit Park, one of the best-known birding spots in Eilat. Many of our guests enjoyed a pre-breakfast morning stroll or, alternatively, viewed the marina at the rear of the hotel for rare herons and kingfishers. We also enjoyed a typically welcoming stay at our regular Kibbutz in the Western Negev where Barn and Long-eared Owls, and Syrian Woodpeckers once again featured on our trips. I'm extremely grateful to the two very amicable groups that came to Israel this year, and to Martyn Kenefick for his excellent co-leadership throughout both tours. Martyn has prepared two superb trip reports which offer nice comparisons between both tours – a 'must' read for anyone planning to go!